If you’re looking for a family playground with sun, sea and sand, it’s hard to go past Yorke Peninsula. Stunning beaches and friendly coastal towns beckon, while inland are historic mining villages and spectacular national parks. Blessed by nature and embraced by sea, Yorke Peninsula is a world apart. Here are magnificent beaches and jagged shorelines, friendly locals and rich farmland. If you love seafood, you can stroll the shallows raking for blue swimmer crabs, dive for crayfish and scallops, or drop a line for King George Whiting. It also boasts some of Australia’s greatest surfing beaches and is strewn with shipwrecks for divers. Back on dry land you can explore mining towns and national parks. Whatever you do, you’ll be made very welcome on Yorke Peninsula! Download the Yorke Peninsula map or browse the Google Map and start making your holiday plans to visit Yorke Peninsula. Yorke Peninsula will become home to the Great Southern Ark, a long-term project for reintroducing native species & rewilding the southern part of the region. The Yorke Peninsula event calendar is your guide to upcoming events in the region, what’s happening this weekend or next year. There's so many things to see & do while visiting Yorke Peninsula. At Innes National Park you can enjoy amazing beaches & scenery, bushwalking, bird watching, photography, camping, fishing, surfing, wildflowers, and history. Eat & drink your way around 700km's of Yorke Peninsula… From fresh seafood or local produce, to a delicious café or pub, you'll find a new favourite on Yorke Peninsula. Yorke Peninsula is known for its 700km's of coastline, beaches & spectacular scenery...you can experience all this and more on the Coastal Way Road Trip. Looking for the ideal Yorke Peninsula accommodation to suit your budget? Use our search feature to look through accommodation options throughout the region – from budget to 4 star, B&B’s to motels, self contained to cottages. You can now Walk The Yorke, 500km of continuous trail on Yorke Peninsula for walking, cycling and leisure activities. 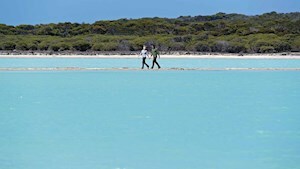 Search for & book Yorke Peninsula accommodation, events, hire, tours, eating out and attractions. Blue Swimmer Crabs, a Yorke Peninsula delicacy! No Yorke Peninsula holiday is complete without raking for Blue Swimmer Crabs, and cooking them up, before plucking the white meat out. The first of its kind in South Australia & the largest in Australia, Windara Reef is a shellfish restoration reef in Gulf St Vincent with great fishing. From Yorke Peninsula's towns, suggested itineraries and places to visit, to the helpful visitor information centres - you can start plotting your next trip. On Yorke Peninsula, you'll find a range of accommodation including self-contained holiday houses, caravan parks, apartments, motels and much more. Book online now!